^ a b c d Glut, Donald F. (1997). “Allosaurus”. Dinosaurs: The Encyclopedia. Jefferson, North Carolina: McFarland & Co. pp. 105-117. ISBN 0-89950-917-7. ^ a b c d e f g h i j k l m n o p q Madsen, James H., Jr. (1993) . Allosaurus fragilis: A Revised Osteology. Utah Geological Survey Bulletin 109 (2nd ed. ed.). Salt Lake City: Utah Geological Survey. ^ a b Foster, John R. (2003). Paleoecological Analysis of the Vertebrate Fauna of the Morrison Formation (Upper Jurassic), Rocky Mountain Region, U.S.A.. New Mexico Museum of Natural History and Science Bulletin 23. Albuquerque: New Mexico Museum of Natural History and Science. pp. p. 37. ^ a b Chure, Daniel J. (2000). A new species of Allosaurus from the Morrison Formation of Dinosaur National Monument (Utah-Colorado) and a revision of the theropod family Allosauridae. Ph.D. dissertation. Columbia University. ^ a b c d e f g h i j k l m n o Paul, Gregory S. (1988). “Genus Allosaurus”. Predatory Dinosaurs of the World. New York: Simon & Schuster. pp. pp. 307-313. ISBN 0-671-61946-2. ^ Molnar, Ralph E. (1977). “Analogies in the evolution of combat and display structures in ornithopods and ungulates”. Evolutionary Theory 3: 165-190. ^ a b c Norman, David B. (1985). “'Carnosaurs'”. The Illustrated Encyclopedia of Dinosaurs: An Original and Compelling Insight into Life in the Dinosaur Kingdom. New York: Crescent Books. pp. 62-67. ISBN 0-517-468905. ^ Paul, Gregory S. (1988). Predatory Dinosaurs of the World. 91 and Figure 4-5 (93). ^ Madsen, 1976; note that not everyone agrees on where the neck ends and the back begins, and some authors such as Gregory S. Paul interpret the count as ten neck and thirteen back vertebrae. ^ a b c d e f g h i j k l Holtz, Thomas R., Jr.; Molnar, Ralph E.; and Currie, Philip J. (2004). Weishampel, David B.; Dodson, Peter; and Osmolska, Halszka (eds.). ed. The Dinosauria (2nd ed. ed.). Berkeley: University of California Press. pp. 71-110. ISBN 0-520-24209-2. ^ Paul, Gregory S. (1988). Predatory Dinosaurs of the World. 277. ^ Chure, Daniel J.; and Madsen, James H. (1996). “On the presence of furculae in some non-maniraptoran theropods”. Journal of Vertebrate Paleontology 16 (3): 573-577. ^ a b c Chure, Daniel J. (2000). “Observations on the morphology and pathology of the gastral basket of Allosaurus, based on a new specimen from Dinosaur National Monument”. Oryctos 3: 39-37. ISSN 1290-4805. ^ Middleton, Kevin M.; and Gatesy, Stephen M. (2000). “Theropod forelimb design and evolution”. Zoological Journal of the Linnean Society 128: 149-187. doi:10.1006/zjls.1998.0193. http://www.brown.edu/Departments/EEB/EML/files/kevin_zjls00.pdf 2007年10月25日閲覧。. ^ a b c d e Gilmore, Charles W. (1920). “Osteology of the carnivorous dinosauria in the United States National Museum, with special reference to the genera Antrodemus（Allosaurus）and Ceratosaurus”. Bulletin of the United States National Museum 110: 1-159. ^ Paul, Gregory S. (1988). Predatory Dinosaurs of the World. 113; note illustrations of Allosaurus on 310 and 311 as well; Madsen (1976) interpreted these bones as possible upper portions of the inner metatarsal. ^ a b Marsh, Othniel Charles (1878). “Notice of new dinosaurian reptiles”. American Journal of Science and Arts 15: 241-244. ^ von Huene, Friedrich (1926). “The carnivorous Saurischia in the Jura and Cretaceous formations, principally in Europe”. Revista del Museo de La Plata 29: 35-167. ^ Romer, Alfred S. (1956). Osteology of the Reptiles. Chicago: University of Chicago Press. pp. 772pp. ISBN 0-89464985-X. ^ Romer, Alfred S. (1966). Vertebrate Paleontology (Third Edition ed.). Chicago: University of Chicago Press. pp. 468 pp.. ISBN 0-7167-1822-7. ^ Steel, R. (1970). “Part 14. 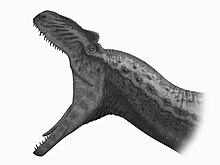 Saurischia. Handbuch der Palaoherpetologie/Encyclopedia of Paleoherpetology”. Gustav Fischer Verlag, Stuttgart: 1-87. ^ Walker, Alick D. (1964). “Triassic reptiles from the Elgin area: Ornithosuchus and the origin of carnosaurs”. Philosophical Transactions of the Royal Society of London, Series B, Biological Sciences 248: 53-134. http://links.jstor.org/sici?sici=0080-4622(19641126)248:744%3C53:TRFTEA%3E2.0.CO;2-K.
^ a b Lambert, David; and the Diagram Group (1983). “Allosaurids”. A Field Guide to Dinosaurs. New York: Avon Books. pp. 80-81. ISBN 0-380-83519-3. ^ Lambert, David; and the Diagram Group (1990). “Allosaurids”. The Dinosaur Data Book. New York: Avon Books. pp. 130. ISBN 0-380-75896-2. ^ Paul, Gregory S. (1988). "The allosaur-tyrannosaur group", Predatory Dinosaurs of the World. 301-347. ^ Holtz, Thomas R., Jr. (1994). “The phylogenetic position of the Tyrannosauridae: implications for theropod systematics”. Journal of Paleontology 68 (5): 1100-1117. http://links.jstor.org/sici?sici=0022-3360(199409)68:5%3C1100:TPPOTT%3E2.0.CO;2-R.
^ a b Mateus, Octavio; Walen, Aart; and Antunes, Miguel Telles (2006). “The large theropod fauna of the Lourinha Formation (Portugal) and its similarity to that of the Morrison Formation, with a description of a new species of Allosaurus”. In Foster, John R.; and Lucas, Spencer G. (eds.). Paleontology and Geology of the Upper Jurassic Morrison Formation. New Mexico Museum of Natural History and Science Bulletin, 36. Albuquerque, New Mexico: New Mexico Museum of Natural History and Science. pp. 123-129. ^ a b Smith, David K. (1998). “A morphometric analysis of Allosaurus”. Journal of Vertebrate Paleontology 18 (1): 126-142. ^ a b c Lessem, Don; and Glut, Donald F. (1993). “Allosaurus”. The Dinosaur Society's Dinosaur Encyclopedia. Random House. pp. 19-20. ISBN 0-679-41770-2. ^ Smith, David K. (1996). “A discriminant analysis of Allosaurus population using quarries as the operational units”. Museum of Northern Arizona Bulletin 60: 69-72. ^ Smith, David K. (1999). “Patterns of size-related variation within Allosaurus”. Journal of Vertebrate Paleontology 19 (2): 402-403. ^ Malafaia, Elisabete; Dantas, Pedro; Ortega, Francisco; and Escaso, Fernando (2007). “Nuevos restos de Allosaurus fragilis (Theropoda: Carnosauria) del yacimiento de Andres (Jurasico Superior; centro-oeste de Portugal)” (Spanish with English abstract) (pdf). Cantera Paleontologica: 255-271. http://www.dfmf.uned.es/~fortega/uned_fo_pdf/2007_Malafaia_etal_EJIP07.pdf. ^ Janensch, Werner (1925). “Die Coelurosaurier und Theropoden der Tendaguru-Schichten Deutsch-Ostafrikas” (German). Palaeontographica, Supplement 7 1: 1-99. ^ Rauhut, Oliver W.M. (2005). “Post-cranial remains of 'coelurosaurs' (Dinosauria, Theropoda) from the Late Jurassic of Tanzania”. Geological Magazine 142 (1): 97-107. doi:10.1017/S0016756804000330. ^ Marsh, Othniel Charles (1884). “Principal characters of American Jurassic dinosaurs. Part VIII”. American Journal of Science, Series 3 27: 329-340. ^ Madsen, James H.; and Welles, Samuel P.. Ceratosaurus (Dinosauria, Theropoda), a Revised Osteology. Miscellaneous Publication, 00-2. Utah Geological Survey. ISBN 1-55791-380-3. ^ Molnar, Ralph E.; Flannery, Timothy F.; and Rich, Thomas H.V. (1981). “An allosaurid theropod dinosaur from the Early Cretaceous of Victoria, Australia”. Alcheringa 5: 141-146. ^ Riabinin, Anatoly Nikolaenvich (1914). “Zamtka o dinozavry ise Zabaykalya” (Russian). Trudy Geologichyeskago Muszeyah Imeni Petra Velikago Imperatorskoy Academiy Nauk 8 (5): 133-140. ^ Leidy, Joseph (1870). “Remarks on Poicilopleuron valens, Clidastes intermedius, Leiodon proriger, Baptemys wyomingensis, and Emys stevensonianus”. Proceedings of the Academy of Natural Sciences, Philadelphia 22: 3-4. ^ Leidy, Joseph (1873). “Contribution to the extinct vertebrate fauna of the western territories”. Report of the U.S. Geological Survey of the Territories I: 14-358. ^ a b Marsh, Othniel Charles (1877). “Notice of new dinosaurian reptiles from the Jurassic formation”. American Journal of Science and Arts 14: 514-516. ^ Marsh, Othniel Charles (1879). “Principal characters of American Jurassic dinosaurs. Part II”. American Journal of Science, Series 3 17: 86-92. ^ Cope, Edward Drinker (1878). “A new opisthocoelous dinosaur”. American Naturalist 12 (6): 406. ^ Norell, Mark A.; Gaffney, Eric S.; and Dingus, Lowell (1995). Discovering Dinosaurs in the American Museum of Natural History. New York: Knopf. pp. 112-113. ISBN 0-679-43386-4. ^ Breithaupt, Brent H.; Chure, Daniel J.; and Southwell, Elizabeth H. (1999). “AMNH 5753: the world's first free-standing theropod skeleton”. Journal of Vertebrate Paleontology 19 (3, Suppl. ): 33A. ^ Williston, Samuel Wendell (1878). “American Jurassic dinosaurs”. Transactions of the Kansas Academy of Science 6: 42-46. ^ Williston, Samuel Wendell (1901). “The dinosaurian genus Creosaurus, Marsh”. American Journal of Science, series 4 11 (11): 111-114. ^ a b Henderson, Donald M. (1998). “Skull and tooth morphology as indicators of niche partitioning in sympatric Morrison Formation theropods” (pdf). Gaia 15: 219-266. ISSN 0871-5424. http://www.mnhn.ul.pt/geologia/gaia/16.pdf. ^ Stokes, William J. (1945). “A new quarry for Jurassic dinosaurs”. Science 101 (2614): 115-117. ^ Hunt, Adrian P; Lucas, Spencer G.; Krainer, Karl; and Spielmann, Justin (2006). “The taphonomy of the Cleveland-Lloyd Dinosaur Quarry, Upper Jurassic Morrison Formation, Utah: a re-evaluation”. In Foster, John R.; and Lucas, Spencer G. (eds.). Paleontology and Geology of the Upper Jurassic Morrison Formation. New Mexico Museum of Natural History and Science Bulletin, 36. Albuquerque, New Mexico: New Mexico Museum of Natural History and Science. pp. 57-65. ^ Loewen, Mark A.; Sampson, Scott D.; Carrano, Matthew T.; and Chure, Daniel J. (2003). “Morphology, taxonomy, and stratigraphy of Allosaurus from the Upper Jurassic Morrison Formation”. Journal of Vertebrate Paleontology 23 (3, Suppl. ): 72A. ^ a b Bybee, Paul J.; Lee, A.H.; and Lamm, E.-T. (2006). “Sizing the Jurassic theropod dinosaur Allosaurus: assessing growth strategy and evolution of ontogenetic scaling of limbs”. Journal of Morphology 267 (3): 347-359. doi:10.1002/jmor.10406. ^ a b Foster, John R.; and Chure, Daniel J. (2006). “Hindlimb allometry in the Late Jurassic theropod dinosaur Allosaurus, with comments on its abundance and distribution”. In Foster, John R.; and Lucas, Spencer G. (eds.). Paleontology and Geology of the Upper Jurassic Morrison Formation. New Mexico Museum of Natural History and Science Bulletin, 36. Albuquerque, New Mexico: New Mexico Museum of Natural History and Science. pp. 119-122. ^ a b Rayfield, Emily J.; Norman, David B.; Horner, Celeste C.; Horner, John R.; Smith, Paula May; Thomason, Jeffrey J.; and Upchurch, Paul (2001). “Cranial design and function in a large theropod dinosaur”. Nature 409: 1033-1037. doi:10.1038/35059070. ^ a b Bakker, Robert T. (1998). “Brontosaur killers: Late Jurassic allosaurids as sabre-tooth cat analogues” (pdf). Gaia 15: 145-158. ISSN 0871-5424. http://www.mnhn.ul.pt/geologia/gaia/10.pdf. ^ a b Rogers, Scott W. (1999). “Allosaurus, crocodiles, and birds: evolutionary clues from spiral computed tomography of an endocast” (pdf). The Anatomical Record 257 (5): 163-173. http://www3.interscience.wiley.com/cgi-bin/fulltext/68500945/PDFSTART. ^ a b Bakker, Robert T. (1997). “Raptor Family values: Allosaur parents brought giant carcasses into their lair to feed their young”. In Wolberg, Donald L.; Sump, Edmund; and Rosenberg, Gary D. (eds.). Dinofest International, Proceedings of a Symposium Held At Arizona State University. Philadelphia: Academy of Natural Sciences. pp. 51-63. ISBN 0-935868-94-1. ^ Chure, Daniel J. (1995). “A reassessment of the gigantic theropod Saurophagus maximus from the Morrison Formation (Upper Jurassic) of Oklahoma, USA”. In Ailing Sun and Yuangqing Wang (eds.). Sixth Symposium on Mesozoic Terrestrial Ecosystems and Biota, Short Papers. Beijing: China Ocean Press. pp. 103-106. ISBN 7-5027-3898-3. ^ Perez-Moreno, B.P. ; Chure, D.J. ; Pires, C.; Silva, C.M. ; Santos, V.; Dantas, P.; Povoas, L.; Cachao, M.; Sanz, J.L. ; and Galopim De Carvalho, A.M. (1999). “On the presence of Allosaurus fragilis (Theropoda: Carnosauria) in the Upper Jurassic of Portugal: First evidence of an intercontinental dinosaur species” (pdf). Journal of the Geological Society 156 (3): 449-452. doi:10.1144/gsjgs.156.3.0449. http://correio.fc.ul.pt/~cmsilva/Artigos/CMS034.pdf. ^ a b Breithaupt, Brent (1996). “The discovery of a nearly complete Allosaurus from the Jurassic Morrison Formation, eastern Bighorn Basin, Wyoming”. In Brown, C.E. ; Kirkwood, S.C.; and Miller, T.S. (eds).. Forty-Seventh Annual Field Conference Guidebook. Casper, Wyoming: Wyoming Geological Association. pp. 309-313. OCLC 36004754. ^ a b Hanna, Rebecca R. (2002). “Multiple injury and infection in a sub-adult theropod dinosaur (Allosaurus fragilis) with comparisons to allosaur pathology in the Cleveland-Lloyd dinosaur quarry collection”. Journal of Vertebrate Paleontology 22 (1): 76-90. ^ Foster, John R. (2003). Paleoecological Analysis of the Vertebrate Fauna of the Morrison Formation (Upper Jurassic), Rocky Mountain Region, U.S.A.. New Mexico Museum of Natural History and Science Bulletin, 23. Albuquerque, New Mexico: New Mexico Museum of Natural History and Science. pp. 29. ^ Russell, Dale A. (1989). An Odyssey in Time: Dinosaurs of North America. Minocqua, Wisconsin: NorthWord Press. pp. 175-176. ISBN 1-55971-038-1. ^ Carpenter, Kenneth (2006). “Biggest of the big: a critical re-evaluation of the mega-sauropod Amphicoelias fragillimus”. In Foster, John R.; and Lucas, Spencer G. (eds.) (pdf). Paleontology and Geology of the Upper Jurassic Morrison Formation. New Mexico Museum of Natural History and Science Bulletin, 36. Albuquerque, New Mexico: New Mexico Museum of Natural History and Science. pp. 131-138. https://scientists.dmns.org/sites/kencarpenter/PDFs%20of%20publications/Amphicoelias.pdf. ^ Chure, Daniel J.; Litwin, Ron; Hasiotis, Stephen T.; Evanoff, Emmett; and Carpenter, Kenneth (2006). “The fauna and flora of the Morrison Formation: 2006”. In Foster, John R.; and Lucas, Spencer G. (eds.). Paleontology and Geology of the Upper Jurassic Morrison Formation. New Mexico Museum of Natural History and Science Bulletin, 36. Albuquerque, New Mexico: New Mexico Museum of Natural History and Science. pp. 233-248. ^ a b Mateus, Octavio (2006). “Jurassic dinosaurs from the Morrison Formation (USA), the Lourinha and Alcobaca Formations (Portugal), and the Tendaguru Beds（Tanzania）: A comparison”. In Foster, John R.; and Lucas, Spencer G. (eds.). Paleontology and Geology of the Upper Jurassic Morrison Formation. New Mexico Museum of Natural History and Science Bulletin, 36. Albuquerque, New Mexico: New Mexico Museum of Natural History and Science. pp. 223-231. ^ a b Bakker, Robert T.; and Bir, Gary (2004). “Dinosaur crime scene investigations: theropod behavior at Como Bluff, Wyoming, and the evolution of birdness”. In Currie, Philip J.; Koppelhus, Eva B.; Shugar, Martin A.; and Wright, Joanna L. （eds.）. Feathered Dragons: Studies on the Transition from Dinosaurs to Birds. Bloomington and Indianapolis: Indiana University Press. pp. 301-342. ISBN 0-253-34373-9. ^ Chure, Daniel J.; Fiorillo, Anthony R.; and Jacobsen, Aase (2000). “Prey bone utilization by predatory dinosaurs in the Late Jurassic of North America, with comments on prey bone use by dinosaurs throughout the Mesozoic” (pdf). Gaia 15: 227-232. ISSN 0871-5424. http://www.mnhn.ul.pt/geologia/gaia/17.pdf. ^ Lee, Andrew H.; and Werning, Sarah (2008). “Sexual maturity in growing dinosaurs does not fit reptilian growth models”. Proceedings of the National Academy of Sciences 105 (2): 582-587. doi:10.1073/pnas.0708903105. ^ Loewen, Mark A.; Carrano, Matthew T.; and Sampson, Scott D. (2002). “Ontogenetic changes in hindlimb musculature and function in the Late Jurassic theropod Allosaurus”. Journal of Vertebrate Paleontology 22 (3, Suppl. ): 80A. ^ Fastovsky, David E.; and Smith, Joshua B.（2004）. "Dinosaur Paleoecology", in The Dinosauria (2nd). 614-626. ^ Kenneth, Carpenter; Sanders, Frank; McWhinney, Lorrie A.; and Wood, Lowell (2005). “Evidence for predator-prey relationships: Examples for Allosaurus and Stegosaurus”. In Carpenter, Kenneth (ed.) (pdf). The Carnivorous Dinosaurs. Bloomington and Indianapolis: Indiana University Press. pp. 325–350. ISBN 0-253-34539-1. https://scientists.dmns.org/sites/kencarpenter/PDFs%20of%20publications/allo-stego.pdf. ^ Frazzetta, T.H. ; and Kardong, Kenneth V. (2002). “Prey attack by a large theropod dinosaur”. Nature 416: 387-388. doi:10.1038/416387a. ^ Carpenter, Kenneth (2002). “Forelimb biomechanics of nonavian theropod dinosaurs in predation” (pdf). Senckebergiana lethaea 82 (1): 59-76. https://scientists.dmns.org/sites/kencarpenter/PDFs%20of%20publications/theropod%20forelimb.pdf. ^ Christiansen, Per (1998). “Strength indicator values of theropod long bones, with comments on limb proportions and cursorial potential” (pdf). Gaia 15: 241-255. ISSN 0871-5424. http://www.mnhn.ul.pt/geologia/gaia/19.pdf. ^ Tanke, Darren H.; and Currie, Philip J. (1998). “Head-biting behavior in theropod dinosaurs: paleopathological evidence” (pdf). Gaia (15): 167-184. ISSN 0871-5424. http://www.mnhn.ul.pt/geologia/gaia/12.pdf. ^ Roach, Brian T.; and Brinkman, Daniel L. (2007). “A reevaluation of cooperative pack hunting and gregariousness in Deinonychus antirrhopus and other nonavian theropod dinosaurs”. Bulletin of the Peabody Museum of Natural History 48 (1): 103-138. ^ Goodchild Drake, Brandon (2004). “A new specimen of Allosaurus from north-central Wyoming”. Journal of Vertebrate Paleontology 24 (3, Suppl. ): 65A.